Having worked with the team at DeWinter on numerous occasions over the past 10 years, both as a hiring manager and as a candidate, I can comfortably say that they are among the best in the Bay Area, and they are my go-to team for finding top talent. Their approach is highly collaborative and they consistently provide exceptional service focused on finding candidates suited specifically to the position and characteristics required. For them it's not about filling reqs, it's about setting people up for success. I see the team at DeWinter as trusted advisers and partners, not just recruiters, a refreshing departure from the norm. They have been and continue to be my first call. I first worked with the DeWinter Group when my company was relocating a significant piece of our finance leadership from Dublin, Ireland to San Francisco. We were searching for no less than 8 roles that ranged from Manager to Director level Finance and Accounting roles – in short, we had to recruit a new group accounting team from scratch. None were easy roles to find and our saying that we had an abbreviated timeline to get this done would be a gross understatement. From the start DeWinter gave us an honest perspective of the search(es) and a true commitment to our well being. Against all odds, our transition was effective and timely, and we were able to recruit a first-rate team of professionals, in no small part due to the resource of the team at the DeWinter Group. Tony does two things that are unusual in the recruiting industry: he listens to what you want and he gives you what you want. Tony has helped me fill several positions at my company. He took the information I gave him outlining our interests and turned it into excellent candidate recommendations. He had done the research, spoken or met with the candidates, and could have a discussion about them with me. I've had an equally exceptional experience working with Tony as a candidate. He heard what I wanted and presented me with opportunities that actually matched. He was also always willing to spend plenty of time talking about the positions and the companies. I have now experienced through five job searches (my own and as an employer) why he is able to make such good recommendations - because he takes the time to talk with the employers and the candidates to get an educated sense of a possible fit. I’ve worked with many recruiters around the Bay Area and Brittany Nguyen and the DeWinter team are the best! Brittany works hard to build a personable relationship and finds positions that best fit me. The whole team definitely separates themselves by being proactive, and responsive. I am impressed with the amount of opportunities I have been provided and how quickly I receive feedback. They go above and beyond to get you an interview and they walked me step by step through the interview process making sure I succeeded at every turn while constantly providing updates. Brian is a pleasure to work with, a true testament to the DeWinter experience, and I highly recommend him. Brian is extremely attentive to his candidates concerns and desires, in my case weighing options in public accounting and corporate accounting. After unrushed brainstorming sessions, he works diligently to present candidates with positions that align with these brainstorming sessions. I am elated with the attentive service both Brian and the DeWinter Group provided and if I find myself searching for new opportunities, won't hesitate to utilize Brian's expertise. DeWinter has never been just an agency to me. DeWinter has been an extension of my team and trusted partner at Twitter and all through my 16 years in the Bay Area. Not only have I been impressed with the candidates they have placed, I have been impressed with the people who represent DeWinter. It all comes down to quality, consistency, and reliability. I would recommend them to anyone without hesitation. I've had the pleasure of working with the DeWinter Group on both ends of recruiting – for myself and for adding to our team. They represent a talented pool of candidates and we couldn't be happier with the candidates they've placed with us. When I was personally working with them, the team was very responsive and I honestly felt that they took a personal, vested interest in helping me find the right next opportunity, and this is a trait that is often rare amongst Search Professionals. Regardless which side you are working with them on, they will take the time to understand the needs of those they are working with, listen to those needs and go to great lengths to research and understand not only the position but the company such that they provide only the highest level of service to the candidates they work with. Tony comes across as sincere, earnest and genuine. It's no wonder why he is able to attract the best talents for companies. Tony was not just keen to know all about my work experience and skill sets, he was also very interested to know me as a person. He wants to ensure that the company and the candidate is a great match before making the introduction. There was a job that I was interested in and had expressed that to a number of recruiters. Tony was the one that successfully pitched me and got me in for in-person interviews. He is diligent in helping me prep for for interviews and facilitates prompt communication among all parties. All done in the nicest possible way. He values relationships, checks in regularly just to see how I am. In the crowded field of recruiting, Tony is one of the best. And someone I trust. 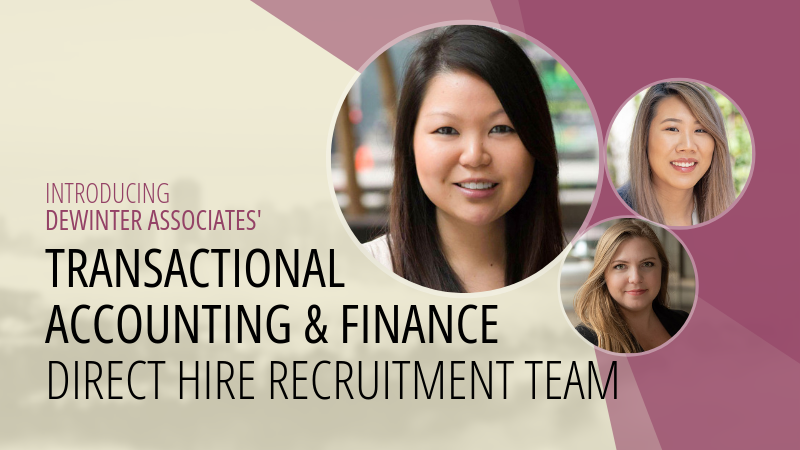 Since we started our business in 2000 we have been focused on a singular goal, to be the single best staffing resource in the Bay Area for Finance and Accounting professionals. Our team of recruiting professionals, whose backgrounds include CPA’s, MBA’s, and work experience from some of the most well-respected companies in the Bay Area, thoughtfully work with your organization’s hiring needs or your personal staffing search. The accounting and finance market knowledge and insight we’ve developed over thousands of successful searches will provide you confidence your search will be conducted professionally and thoughtfully. Whether you are VC backed start-up looking for your first CFO, VP of Finance, or Controller or you’re a publicly listed technology company trying to hire a Director of Financial Planning and Analysis, we are the firm you can trust to find the best accounting and finance talent the market has to offer. We know the right people. Our unique ability to couple our own personal work experience with years of recruiting knowledge makes us the logical choice for you as you begin your search. If you have a high caliber academic and professional background and wish to partner with an organization that legitimately cares about your professional objectives, then let us use our network to help you identify the next chapter in your career. We have the right relationships. Check out DeWinter Partners for retained executive search for finance and accounting professionals. 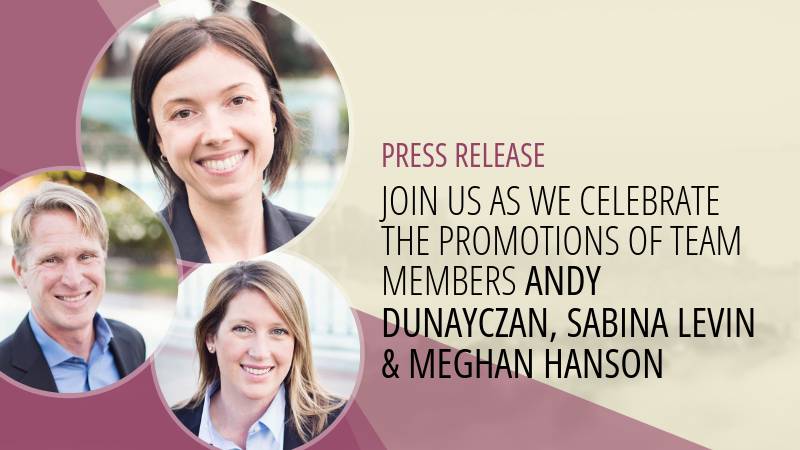 Join the DeWinter Group as we celebrate the 2019 promotions of DeWinter Associates team members Andy Dunayczan, Sabina Levin and Meghan Hanson! Are you searching for AP, AR, payroll, credit or collections professionals for your team? DeWinter Associates announces a division dedicated to supporting Bay Area employers in their search for transaction-level accounting professionals. The DeWinter Group’s accounting and finance direct hire division, DeWinter Associates, welcomes Executive Recruiter, Jenna Rosati.